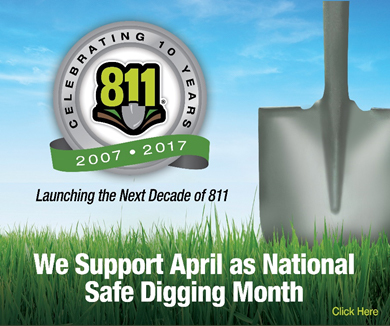 This April marks the 10th annual National Safe Digging Month, reminding Hawaii excavators to always call 811 before any digging project. In Hawaii, all excavators planning to conduct an excavation on public or applicable private property are required to notify the One Call Center, by calling 811, of the excavation at least five working days but not more than twenty-eight calendar days prior to commencing excavation. Our land is made up of a complex underground infrastructure of pipelines, wires and cables. Striking an underground utility line while digging can cause harm to you or those around you, disrupt service to an entire neighborhood, and potentially result in fines and repair costs. National Safe Digging Month serves as a reminder to all people who excavate or dig to call 811 to have the approximate location of underground lines marked by utility companies. The One Call Center system will provide advanced warning to excavators of the location of the underground lines before they begin digging. This helps prevent injuries, property damage, and the inconvenience of utility outages.